The synchronization of metabolic and physiological processes with the environment results in time-of-day dependence (gating) of responses to stress. Temporal gating is thought to maximize stress resistance while minimizing growth costs. The temporal coordination of environmental signals with plant physiology requires an endogenous circadian oscillator. Latitudinal gradients in circadian clock period among natural populations and highly bred crops support the role of the clock as a central regulator of plant adaptability. To understand the underlying transcriptional network contributing to drought response we performed a two-day RNAseq time course experiment in the crop Brassica rapa comparing drought with well-watered conditions, where circadian regulation results in time of day-dependent changes in stomatal conductance and CO2 assimilation. A comparative network-based approach provided the temporal resolution to correlate co-expressed modules with dynamic changes in physiology. Early drought perception causes extensive rearrangement of the gene regulatory network that is best characterized by altered gene expression patterns. Classifying these changes by assessing differential expression at each time point fails to capture daily transcriptome dynamics. To retain the pattern of transcript abundance over time we used the module membership measures from the network analysis to test for altered expression patterns under drought. We associated specific responses to drought of circadian clock regulated genes assigned based on two 48 h circadian RNAseq datasets collected following either photocycle or thermocycle entrainment with 2 h sampling. In addition to support for circadian involvement in drought response, this pattern discovery approach identified examples of divergence among homeologs. These represent candidates for subfunctionalization following genome triplication since diverging from Arabidopsis thaliana and supports previous work showing preferential retention of circadian clock genes in B. rapa. This analytic pipeline for assessing changes in expression pattern can be applied to any time series dataset and will be available as a package in R.
Kathleen Greenham studies the consequences of internal timekeeping on plant fitness. She uses network approaches to combine temporal studies of abiotic stress response to identify diel markers of stress tolerance. As an NSF National Plant Genomes Initiative Postdoctoral Fellow, she applied co-expression network analysis to integrate temporal changes in transcriptomic and physiological responses to drought in the crop Brassica rapa. This study revealed early indicators of drought perception and the importance of time when assessing drought response. Dr. Greenham received her B.A. at Queen’s University in Canada and completed her PhD with Dr. Mark Estelle at UC San Diego. She is currently finishing her postdoctoral work at Dartmouth College and will be starting as Assistant Professor in January 2019 in the Department of Plant and Microbial Biology at the University of Minnesota. She can be found early most mornings at the local CrossFit box or out on her bike. 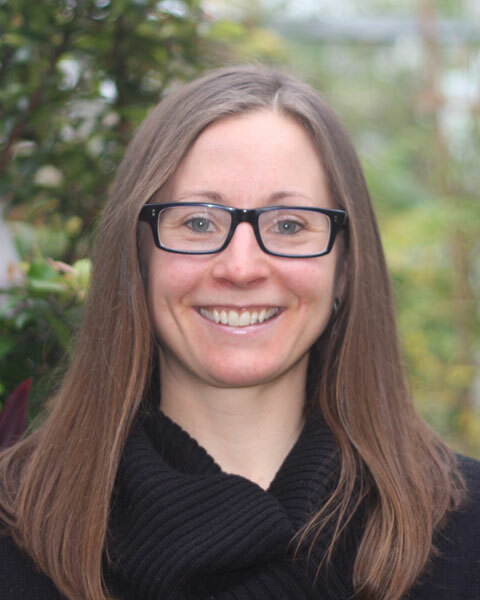 Bio: Kathleen Greenham studies the consequences of internal timekeeping on plant fitness. She uses network approaches to combine temporal studies of abiotic stress response to identify diel markers of stress tolerance. As an NSF National Plant Genomes Initiative Postdoctoral Fellow, she applied co-expression network analysis to integrate temporal changes in transcriptomic and physiological responses to drought in the crop Brassica rapa. This study revealed early indicators of drought perception and the importance of time when assessing drought response. Dr. Greenham received her B.A. at Queen’s University in Canada and completed her PhD with Dr. Mark Estelle at UC San Diego. She is currently finishing her postdoctoral work at Dartmouth College and will be starting as Assistant Professor in January 2019 in the Department of Plant and Microbial Biology at the University of Minnesota. She can be found early most mornings at the local CrossFit box or out on her bike.